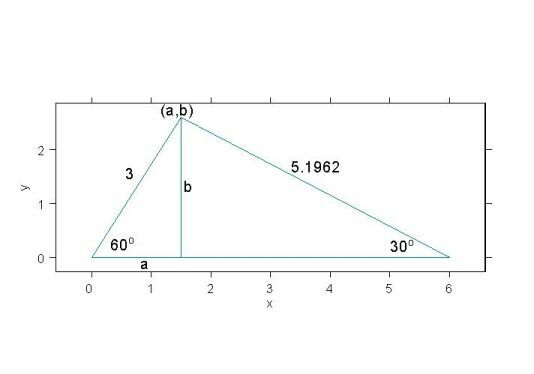 Find (a) the area and (b) the length of the perimeter of this triangle correct to 2 decimal places. First, let's find the area. 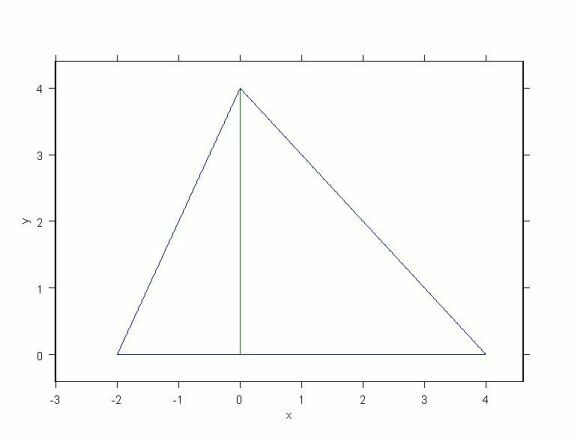 The base of this triangle goes from x = -2 to x = 4. So, the length of the base is 4 - (-2) = 6. The height of this triangle goes from y = 0 to y = 4. So, the height is 4 - 0 = 4. The area of this triangle is (6)(4)/2 = 12. To find the perimeter we need the lengths of the left side and the right side using the Pythagorean theorem. You'll notice that I drew a line for the height. If you're smart you noticed that it divides the triangle into 2 right angled triangles. Let's call the left side "a" and the right side "b" (for those of us who are Three Stooges fans, we could call the 3 sides Moe, Larry and Curley). rounding the answer to 2 decimal places. Doing the same exercise for the right hand triangle, with the base now 4 and the height still 4, we get b = 5.66. Adding everything together, the length of the perimeter is 4.47 + 5.66 + 6 = 16.13. 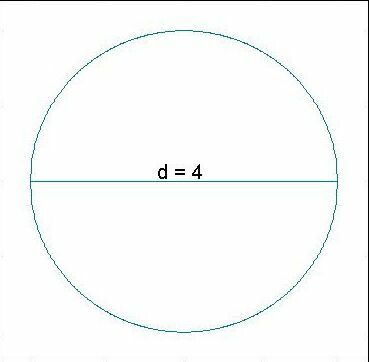 Find (a) the circumference and (b) the area of this circle correct to 2 decimal places. Since we're rounding the answer to 2 decimal places, let Pi = 3.14. Since the diamater is 4, that means the radius is 2. So, the circumference is (2)(3.14)(2) = 12.56. The area is (3.14)(22) = 12.56. This is the one situation where the area of a circle equals its circumference. 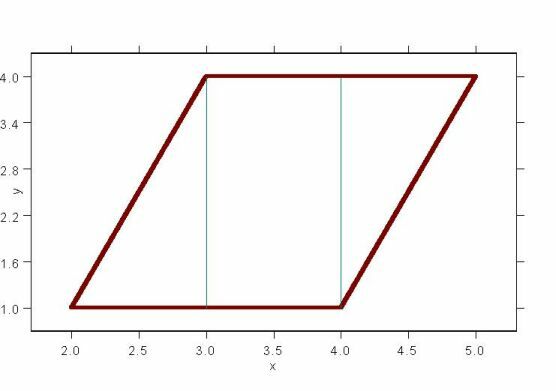 Find (a) the area and (b) the length of the perimeter of this rhombus correct to 2 decimal places. The area is easier to find, so let's do that one first. The base goes from x = 2 to x = 4. So the length of the base is 2. Choosing either of the vertical lines, the height goes from y = 1 to y = 4. So the height is 3. Ergo (there's some Latin for you), the area of this rhombus is (2)(3) = 6. To find the length of the perimeter, the geniuses among you will notice that the top and bottom are the same length and that the left and right sides are the same length. All we have to do is find the length of the left side and we're home. Taking the square root of both sides we get a = 3.16 rounding the answer to 2 decimal places. Adding everything together, the length of the perimeter is 2 + 2 + 3.16 + 3.16 = 10.32. You have a rectangle where the width is 1/3 the height. If the perimeter of this rectangle is 48 cm, what are its dimensions? Solution: Let W = width and H = height. Since the width is 1/3 the height, we can write H = 3W which is another way of saying the height is 3 times the width. We are given the perimeter to be 48 cm. We can write 2W + 2H = 48 or W + H = 24, by dividing both sides of the equation by 2. But, since H = 3W we can rewrite W + H = 24 as W + 3W = 24 or 4W = 24. Solving for W, we get W = 6 and by plugging this solution into H = 3W, we get H = 18. So our rectangle is 6 cm wide and 18 cm high. You have an isosceles triangle where the two equal sides are each twice as long as the base which is 6 cm long. What is the height of this triangle correct to 3 decimal places? Taking the square root of both sides, we have H = 11.619 round to 3 decimals places. So the height of our triangle is 11.619 cm. You have a square where the distance from 1 corner to its opposite corner is 2 cm. What are the dimensions of this square correct to 3 decimal places? by dividing both sides by 2. Taking the square root of both sides, we have X = 1.414 rounding to 3 decimal places. 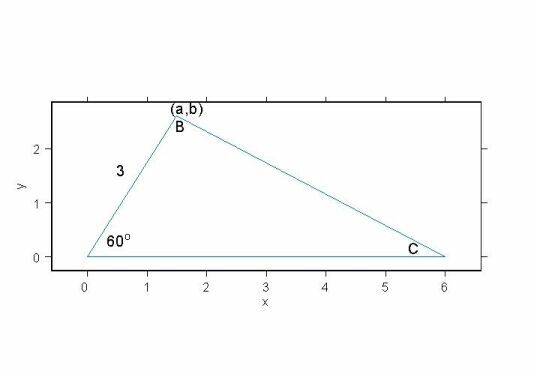 1) What are the coordinates of the point at the top of this triangle? 2) What is angle b in degrees correct to 4 decimal places? 3) How long is side C correct to 4 decimal places? Let's call the triangle on the left A and the one on the right B. We'll also call the height of the triangle h.
Question 3): There are a couple of ways to slay this dragon. The easiest is to use the Pythagorean theorem. We have c2 = 5.19622 + 22 or c2 = 31. Solving for c, we get c = 5.5678. 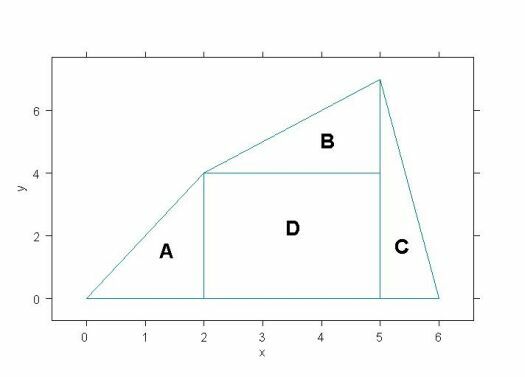 1) Find the area of this polygon. 2) What are the angles of the 4 corners correct to 4 decimal places? The first thing we do is split the polygon into 3 triangles and 1 rectangle. Adding up the areas of the 4 figures, we get the total area: 4 + 4.5 + 3.5 + 12 = 24. So, the total area of the polygon is 24 sq. units. If you add up the 4 angles, you will see that they total 360o which they are supposed to. 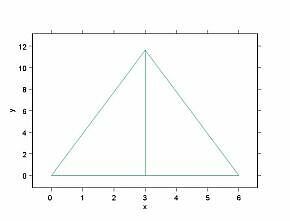 If the height of this triangle is 5 units, what are the lengths of sides A, B, and C correct to 4 decimal places? The easiest approach is to find the lengths of sides B and C first, then use the Pythagorean theorem to find the length of side A since we have a right-angle triangle. Solving for B, we have sin(30o) = 5/B or 0.5 = 5/B. Cross-multiplying to solve for B we get B = 10. 1) What are the angles of B and C? 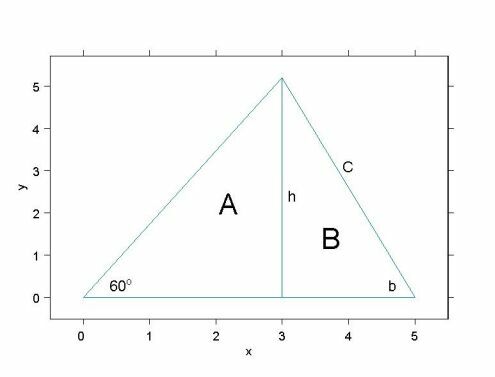 2) What are the co-ordinates of (a,b) at the top of the triangle? Solving for cos B we get cos B = 0. Since cos 90o = 0, we have angle B = 90o. Ergo, angle C = 30o because the 3 angles in the triangle have to add up to 180o.